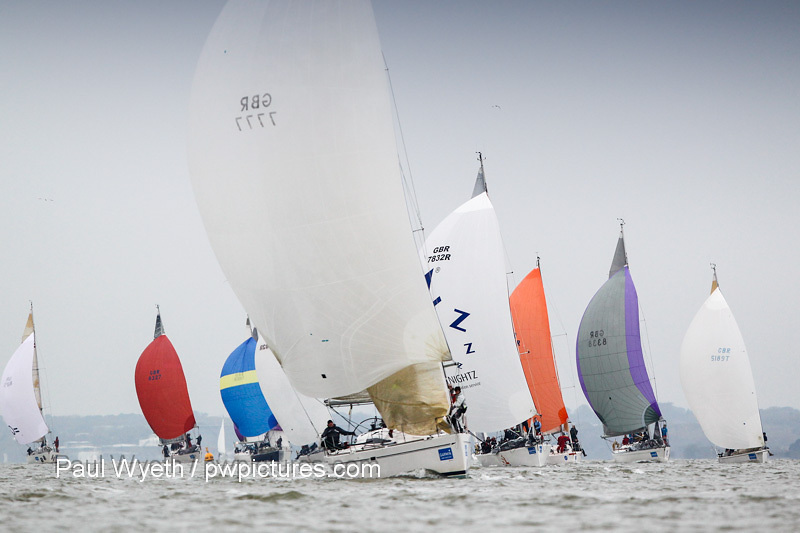 A light forecast presented a challenge to the race committee in the Garmin Hamble Winter Series this week. With the fickle and shifty wind in the north, the committee boats stalked the fleet with the 'shortened course' flags, but the wind held, and despite the building tide the fleets finished in time to repair to the clubhouse for beer and chips. The race officer set courses that included a spinnaker reach as well as beats and runs, and with windward marks to port and starboard foredeck crews and trimmers were kept on their toes. In IRC0, James Gair's Localletterbox Zero II won her class, despite returning at the start as flag X-Ray was hoisted. In IRC 1, it was Philip Farrands' Old Mother Gun that won the race, ahead of Paul Jones' Passion. The light winds also suited Jungle Drum in IRC2, and with her bright pink spinnaker she led her class around the race course. In class 3, Induljence topped the fleet, but there are three boats just one point apart, so there is all to play for over the next two races. In class 4, quarter-toner Menace followed her 2nd last week with a first place, ahead of Impala 28 Trudi in 2nd. In the One Design classes, David McGough's Just So won the J/109S ahead of Owain Franks' Jynnan Tonnyx. 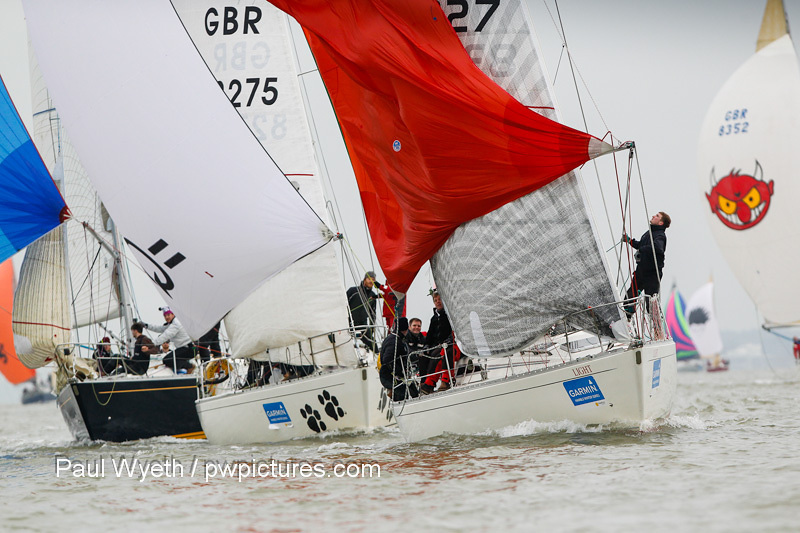 David and Kirsty Apthorp's J/Dream was first J/111, while Chris and Vanessa Choules on With Alacrity won the Sigma 38s ahead of Rob Denning's Light. Force 4 Chandlery, which opens at 0730 on race days, was Day Sponsor, and Athena Rossi from Port Hamble was on hand to present prizes. The club also presented prizes to the local Foxer fleet, who held their winter championships over the same weekend. They fitted in an impressive 12 race series, which was won by Craig Burlton, with Geoff Carveth 2nd and Ian Southworth 3rd. 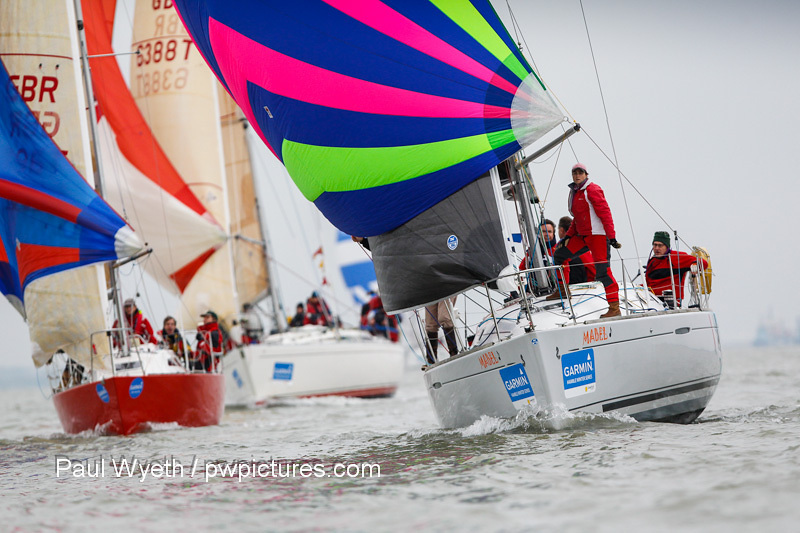 Two race days remain in the Garmin Hamble Winter Series - we've had a range of challenging conditions so far, and it remains to be seen what the weather gods hold in store for the next two weekends. Whatever they throw at us, the racing is set to be close and exciting, with single-point differences in many fleets sure to keep the results uncertain until the final race is run.